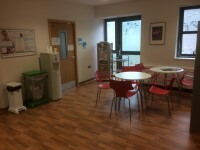 Services on the ground floor include: Meadow Ward, Woodland Ward and Oupatients services. New Haven is located on the Princess of Wales Community Hospital site. 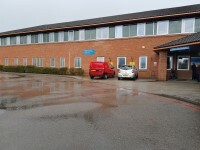 Princess of Wales Community Hospital is located on Stourbridge Road and can be accessed by the A38 in Bromsgrove. 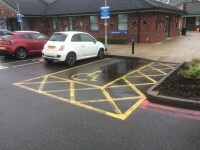 Blue Badge parking spaces are available at the main entrance and ambulance entrance. 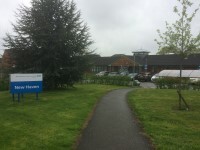 The nearest bus stop is located within the hospital site outside the main entrance with routes 43 and 97 stopping here. The nearest train station is Bromsgrove. The following links are for bus services for the Princess of Wales Community Hospital. The following links are for train services for the Princess of Wales Community Hospital. 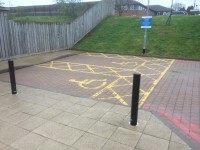 The dimensions of the designated Blue Badge parking bay(s) surveyed are 365cm x 610cm (11ft 12in x 20ft). 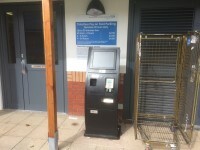 Payment machines are located Outside the New Haven Main Entrance. 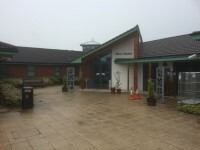 The entrance is not clearly visible from the car park. The route from the car park to the entrance is clearly signposted. 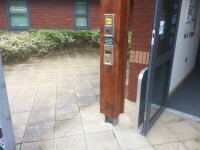 The surface on the approach to the entrance is concrete tiles and tarmac and block paving. 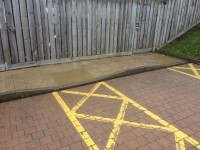 There is some tactile paving on dropped kerbs between the car park and the entrance. The nearest designated Blue Badge parking bay is approximately 20m (21yd 2ft) from the New Haven Main Entrance. There is an onsite bus stop. The bus stop is located outside the main hospital entrance. 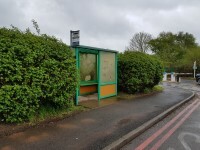 The bus stop is sheltered with benched seating, there is not room for a wheelchair. The bus stop is 20m from the hospital main entrance with a slight ramp/slope just in front of the main entrance. The drop-off point is located directly outside the main hospital entrance. The drop-off point is 4m from the main entrance with a slight ramp/slope just outside the main entrance. You are on Outside Access (New Haven Main Entrance). Skip to the next section. 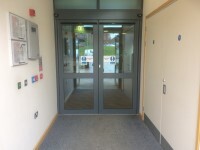 The width of the door opening is 186cm. 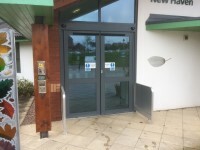 The reception point is located to the left on entering the New Haven Main Entrance. The reception point is approximately 3m (3yd 10in) from the New Haven Main Entrance. 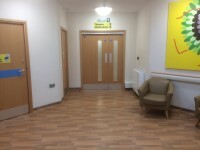 Signs and universally accepted symbols or pictograms, indicating lifts, stairs, WCs, circulation routes and other parts of the building are not provided in the reception area. 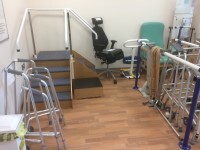 You are on Consultation / Treatment Room (Physiotherapy). Skip to the next section. There is / are 5 consultation / treatment room(s) available. 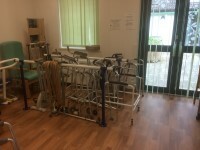 The name / number of the room surveyed was; Physiotherapy. You are on Accessible Toilet(s) (Right Hand Transfer). Skip to the next section. 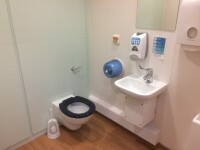 This accessible toilet is located past reception, through the doors and to the right on entering the central area. 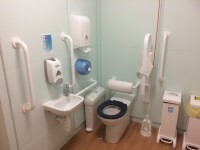 This accessible toilet is approximately 18m (19yd 2ft) from the New Haven Main Entrance. 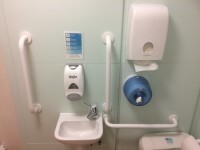 The dimensions of the accessible toilet are 168cm x 281cm (5ft 6in x 9ft 3in). There is a push button alarm in the toilet. There is a flashing fire alarm beacon within the toilet. 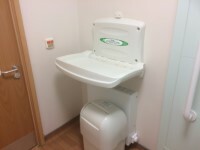 The height of the baby change table once extended is 110cm (3ft 7in). 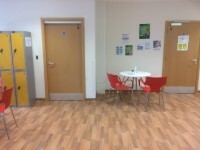 The female and male toilet facilities that were surveyed are located to the right past reception. The female and male toilets are approximately 9m (9yd 2ft) from the New Haven Main Entrance. There is a flashing fire alarm beacon within the toilets. 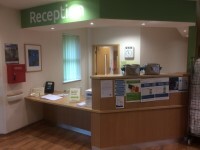 Princess of Wales Community Hospital - Main Building link (new tab) - click here.